If you have time to read only one paragraph, then read this: DO NOT BUY the watts premier three stage countertop reverse osmosis system. Instead, I will go for any of the models recommended in my best countertop reverse osmosis system for 2015. The reason for my thumbs down is due to several reasons. Among them, the most important is its non durability. I saw many amazon reviewers saying that this system can’t last for more than 1 year, which I found to be totally rubbish. If you want to know the system’s other faults, read on below. 3 stage ro unit: this model has only 3 stage reverse osmosis filters. In other models, it is usually 4 to 5 stage. This already tells me that the water filtering isn’t going to be on par with the best of the best. So, why bother? Even though it can save water by channeling the ‘wasted water’ into other parts of the house, this is not what a RO unit’s main function to be. If you are buying one, it is because you want clean water with a TDM that is less than 10 PPM. This model doesn’t deliver that kind of results. Faucet assembly problem and leaks: Leaks is one of the major complaints for this system. I do not know if the material is the cause of the leaking or the manufacturing but this is a serious issue that deducts a lot of marks from this system. According to what I read in the reviews, the faucet incompatibility is the cause for most of the leaks. In particular, the actual faucet is made from plastic rather than the brass and that causes the faucet not to fit 100%. Worst of all, the customer support department of Watts Premiere seems to be in denial as they refuse to acknowledge this problem by suggesting solutions that do not address the core issue. Bad taste after 1 year: I find that most of the parts for the Watts Premiere RO system is made of cheap plastic. This might be the reason for a rubbery taste tends to develop after one year of using the RO system. An Amazon reviewer suggested that this might be due to a failing the lining that causes the water to be contaminated with the rubbery taste. Again, this is a very serious problem that I wouldn’t want to face with any home reverse osmosis system. 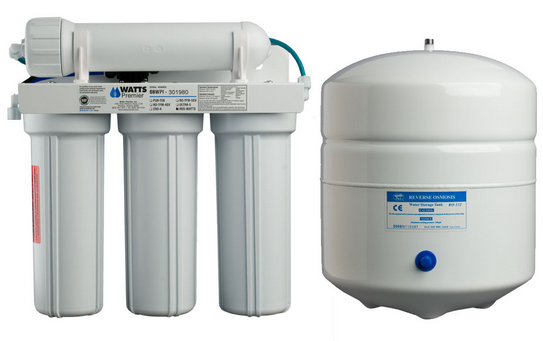 To conclude, there are some serious problems with the Watts Premiere zero waste reverse osmosis system. Although it claims to save you water, there are many downsides that outweigh this benefit. I think that is why this system has been discontinued to make room the current 4 stage RO system. From what I have read so far, it seems the 4 stage system still retains many of the weakness of the 3 stage system. If you are looking for the top Ro unit, I suggest taking a look at the best reverse osmosis system for 2015.